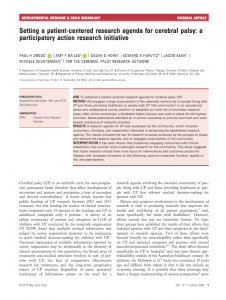 In addition to the publication of these research areas for CP researchers to consider, several other important steps have been taken by CPRN to ensure the priorities of Research CP are realized to benefit people with CP. CPRN has integrated the Research CP agenda into its core criteria for evaluating research projects and created a community advisory committee to continue the dialogue about these research ideas. It plans to facilitate an ongoing dialogue with the community about these research projects. CPRN and CP NOW appreciate the support of several organizations in making this initiative possible including an award from the Patient-Centered Research Outcomes Institute, additional funding support from the Cerebral Palsy Alliance Research Foundation and the support for dissemination of these results from the American Academy for Cerebral Palsy and Developmental Medicine.